It comes to my attention that scaling is indeed apparently a lost art. This realization has come from many regurgitated scaling arguments wherein many have demonstrated a poor understanding of volumetric measurement and generally poor mental grasps of large objects and comparative scale. First and foremost, let's address the basic issue of volume. 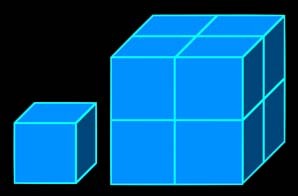 Volume varies primarily with the cube of dimension; that is, for some measured dimension d, V=kd3, where k is a constant relating to the shape. In the case of a cube, this constant is one, naturally enough. K can be considered the volume coefficient (VC) of the particular shape. By doubling the cube's dimensions, we've increased the volume eight-fold. If we tripled the dimensions, the increase would be 3 x 3 x 3, or 27-fold. we'd no longer have a cube. *Where h and w are the reduced dimensions and d is the unchanged dimension. **I.e., measuring length and width from the points of a four sided diagram rather than the sides. Sides no longer must be perpendicular, although the cut has to be along a uniform object (same with triangle). As a further note of reference, you may find here a reference page estimating the volume of various Star Trek and Star Wars objects; you may find it highly useful. Just remember that if you rescale an object, its volume rescales cubically. To derive the VC from a given volume, divide the volume by the cube of the length. Bob wants to approximate the volume of a new kind of star destroyer. Bob builds a model with no "bridge tower"; sleeker than an ISD, he decides that it's a new "fast star destroyer." He's not sure how long he wants it to be, but it's twice as wide as it is high, and five times as long as it is wide. To approximate the volume simply, we can use what we know about star destroyers and the above to reach a fairly accurate volume coefficient. We know his "box" is 1x(1/5)x(1/10), so he initially multiplies by 0.2*0.1/12 to get 0.02. It's further cut into a diamond, halving the volume, and narrows from a flat base to a point, so its volume coefficient is the box coefficient divided by six - ~0.0033. Those with a more advanced knowledge of basic high school geometry may note that the volume of a pyramid - Bob's FSD - is the height times the base divided by three. In this case, the base is 1/100 (a diamond subtended inside a rectangle 0.1x0.2, and the height 1, so the volume must be 1/300. If Bob's FSD is 1200m, it would have a total volume of 5,760,000 cubic meters. By comparison, the VC of an ISD is ~0.013 and that of the Executor ~0.0023, to the best of my knowledge. There are many objects whose scaling is as controversial as the scalings of Starbase 74 and its classmates. Most of the disagreement over Starbase 74's size derives (as many Star Trek scaling controversies do) from the reuse of an older model - Spacedock. Spacedock was originally just large enough to fit a Constitution class through the doors originally, and the model was then reused in TNG scaled just the same way - relative to the Enterprise, that is. Unfortunately, the Enterprise had changed size dramatically. The new Galaxy class Enterprise-D was over twenty times as large as the refit Constitution class Enterprise, which meant that the TNG starbase had to be correspondingly larger. Some have said that the model should be assumed to have larger doors than seen; some have said that the details of the station's appearance should not be considered completely accurate (it should look "like" but not "exactly like" Spacedock) but for a strict visual constructionist, there is no choice but to accept the large and seemingly very similar starbases of the TNG era at face value. The main hangar door (the largest hangar door, that is, and most likely to accomodate a Galaxy class - these are the doors we've seen used) has been highlighted above with a 50 pixel long violet line. This line covers the entire top mark of the door. We know that a Galaxy class can fit; we know that it is, however, a reasonably snug fit, and that the hangar in question is not much larger. In order to fit a GCS, how large does this door have to be? This will depend on the width of the GCS and the clearance; some have claimed clearance of roughly 20%, a somewhat comfortable margin. 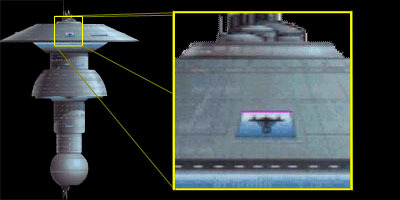 At a minimum, a margin of 10% total (that's 1/20th the width of the ship (5%) to each side) should separate the edges of the saucer from the edges of the door. So, how wide is a GCS? There are two common references: 464m, and 560m. In general, however, the length is cited as 641m, which eliminates - by inspection of the model's length to width ratio - the higher figure. Adding a 10% safety margin we get, very neatly, a 500m width for the door, or 1 pixel per 10 meters, which in turn gives a width of 8550m for Starbase 74. A 20% margin, plus a couple extra meters for bad pilots and a doorstop (door width not exactly matching passageway size) gives us a nearly as convenient 11 meter per pixel size, which would scale to 9405m across. Proportionally, the bays should be about the same relative size in either case; in the smaller, the bays, if 500m wide, would have to be about 300m high and probably 700m deep - a 105 million m3 box. We know there are four bays of this size on Spacedock; it appears as if there are also other bays of smaller size, or large windows. If there were twenty bays of this size on a Starbase 74, or the equivalent, it would take up all of 2.1 billion m3... in other words, just over 3% of the volume of the starbase. This is, generally speaking, a drop in the bucket, although a fairly significant raw quantity of internal docking by any standard. So describing Starbase 74 as "mostly hollow" doesn't really cut it. Those of you who just did the math and looked back at it are now noticing how much larger the VC for the UFP station is than for the SSD. Starbase 74, thanks to its great width, roundness, and comparative lack of tapering, takes up nearly a full tenth of the volume of a cube of the same overall dimension, while the very skinny SSD has a VC of just under one four hundredth. It may be significantly longer, but it turns out to be a much less bulky object - a 17.6 km long Executor has a total volume of ~12.6 billion m3. 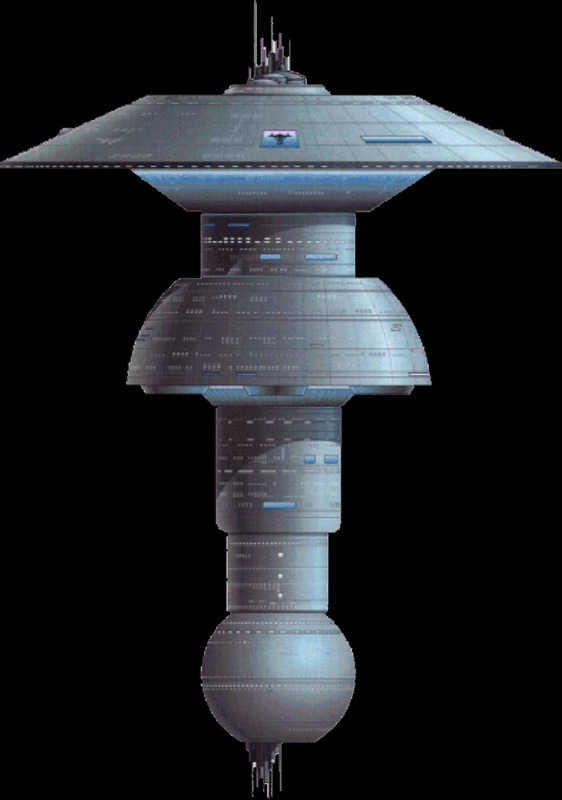 An Imperial Star Destroyer scaled up to 17.6 km long would be ~70.6 billion m3, roughly the same overall size as Starbase 74... or, in other words, it would take well over a thousand ISDs to match one Starbase 74 in volume, or a half dozen 17.6 km long Executors. That's big. And, judging by our relatively small sample of starbases seen on screen and described, the "enlarged Spacedock" type of starbase may well be the most common starbase of the TNG era. Ignore it at your peril. Exercise 1: Correlating the lessons. Examining the full-size picture of Starbase 74, use the techniques of Section 1 to approximate its volume. You may assume that it is radially symmetric. Begin by discarding the antenna and taking the body as a series of cylinders stacked on top of one another. As you replace cylindrical segments by adding and subtracting spheres and cones, examine what happens to your estimation of the station's total volume. Compare your results with the value of the VC stated in this article. Exercise 2: The Super Star Destroyer in Detail. What size would the following ships need to be scaled to in order to match a 17.6 km Executor in volume? What about an 8 km Executor? (a) By what factor would the volume be changed between an 8 km and 17.6 km ship of the same shape? Between 12 and 12.8 km? (b) How many times the volume of an ISD could a Super Star Destroyer like the Executor be? (c) By what factor would the volume of a 12 km long Star Destroyer shaped roughly like an ISD differ from that of a 17.6 km Executor? What about an 8 km of the same type? (d) How long would the Executor need to be in order to have the same total volume as Starbase 74? (a) Ambassador class, with a VC of 0.02. (b) A type 6 shuttle, with a VC of 0.12. (c) Defiant class, with a VC of 0.036. (e) A Klingon battlecruiser with a VC of 0.011. V=kd� works well for comparing different starship classes, as in the case of Exercise 3 above, or for modifying a ship, as with Bob's Fast Star Destroyer. However, if all you're doing is trying to rescale a particular ship and get different volume, then the difference in length (or width or height) is the only criteria of consequence. For a static shape, doubling the length results in a volume of 2� over the former volume, and a surface area 2� over the former surface area. That's 8 times and 4 times, respectively, as can be confirmed via trying it on a cube. More generally, if you're going to multiply an existing shape by X (be it 2 to double the length, 3 to triple, 0.5 to halve, or what-have-you), you can cube X and multiply the original volume by the result to get the new volume, or you can square X and multiply the original surface area by the result to get the new surface area.